The Wuest Group is broadly interested in molecular design and synthesis, and we work with a wide range of organic, organometallic, and inorganic compounds. Molecular association plays an important role in our projects, and one of our principal objectives is to learn how to exploit weak interactions to control molecular association. By integrating an ability to synthesize complex molecules, to direct their association, and to characterize the resulting structures and their properties, we hope to contribute to advances in a variety of areas of research, including materials science, surface science, and nanotechnology. Starting in the 1980's, the Wuest Group began to develop strategies for the rational construction of ordered molecular materials. We think that one of the greatest current challenges in science is to learn how the structure and properties of individual molecules are related to those of their aggregates. Mastering this relationship will allow new molecular materials to be made by design, creating opportunities for breakthroughs in many areas of technology. Getting to this point will not be easy, however, in part because most intermolecular interactions are weak and complex. The directed association of tectons produces well-defined networks. The molecular structures of the individual tectons can then be altered logically to create series of structurally related networks, with predictable expansion or contraction on the sub-nanometric scale. For example, expansion of networks built from tectons derived from tetraphenylmethane can be achieved by replacing the central carbon atom with silicon, thereby incorporating longer Si-C bonds in place of C-C bonds (J. Am. Chem. Soc. 2003, 125, 1002). Moreover, charge can be introduced rationally by the simple expedient of building analogous networks from anionic or cationic tectons derived from tetraphenylborate or tetraphenylphosphonium, respectively (J. Am. Chem. Soc. 2005, 127, 5910). 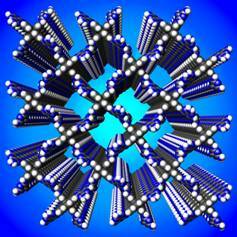 In recent work, we have engineered crystals built from hexaphenylbenzene and related disk-shaped aromatic compounds (J. Am. Chem. Soc. 2007, 129, 4306). Figure 1 illustrates one of the fascinating structures that have resulted from this work so far. Figure 1. Hydrogen-bonded sheets produced by the crystallization of a derivative of hexaphenylbenzene (J. Am. Chem. Soc. 2007, 129, 4306). Figure 2. Representation of a highly porous hydrogen--bonded network produced by the crystallization of a derivative of spirobifluorene (J. Org. Chem. 2004, 69, 762). Tectons can easily be designed in a way that makes it difficult or impossible to optimize packing and intermolecular interactions at the same time. When tectons are specifically constructed to have awkward shapes that cannot be packed efficiently, then the resulting networks can have exceptional porosity. For example, our group has shown that a tecton derived from spirobifluorene yields crystals in which 75% of the volume is accessible to guests, which can be exchanged in single crystals without loss of crystallinity (cover article published in J. Org. Chem. 2004, 69, 762). Figure 2 represents the porous network present in these crystals. The porosity is the highest ever observed in hydrogen-bonded networks constructed from small molecules, thereby underscoring the potential of using tectons to create molecular analogues of zeolites. Tectons can be designed to give permeable crystals that react with external agents to give single crystals of new compounds, with retention of the original crystalline architecture (cover article published in Angew. Chem., Int. Ed. 2003, 42, 5303). This strategy has the potential of delivering single crystals of new compounds directly, in predictable polymorphic forms. In some cases, these forms may be impossible to obtain by direct crystallization. Single crystals can also be designed to react with agents that penetrate the crystals and cleave fragments from the network, thereby excavating the interiors and increasing the volume available for guests, all without loss of crystallinity (Chem. Commun. 2003, 2966). 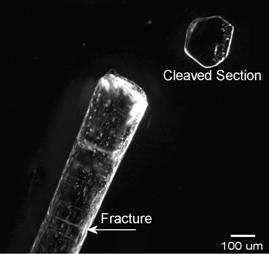 Figure 3 shows us excavating a crystal. Figure 3. 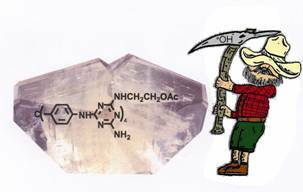 Excavating the interior of a permeable molecular crystal by hydrolyzing acetyl groups (Chem. Commun. 2003, 2966). Figure 4. Representation of the photochemical cross-linking of a permeable hydrogen-bonded molecular crystal to create a covalently-bonded crystalline macromolecular replica (Angew. Chem., Int. Ed. 2003, 42, 5303). Suitably designed permeable crystals can be cross-linked covalently by the strategy outlined above, thereby capturing temporary supramolecular constructs as permanent crystalline macromolecular replicas (Angew. Chem., Int. Ed. 2003, 42, 5303). This work was cited among the highlights of chemistry in 2003 (Chem. Eng. News 2003, 81 (51), 39). Figure 4 illustrates a representative photochemical cross-linking within a hydrogen-bonded molecular crystal. The initial emphasis of work in the Wuest Group has been on engineering ordered three-dimensional materials, but the strategy of molecular tectonics also offers an effective way to control organization in two dimensions, thereby allowing the predictable construction of nanopatterns on surfaces (J. Am. Chem. Soc. 2007, 129, 13774; Langmuir 2007, 23, 11980; J. Phys. Chem. C 2007, 111, 16996; J. Am. Chem. Soc. 2006, 128, 4212). We have worked hard during the last several years to become capable surface scientists, and the techniques of STM, AFM, SEM, and TEM are now used in the group on a daily basis. Figure 5 shows a recently recorded STM image of a new hydrogen-bonded network adsorbed on graphite. We are optimistic that our continuing work in this general area will show the advantages of a tightly integrated approach featuring the ability to synthesize complex molecules, determine three-dimensional crystal structures, and characterize molecular organization on surfaces. Figure 5. 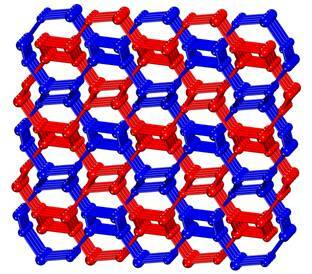 STM image of a hydrogen-bonded molecular Kagomé network adsorbed on HOPG (J. Am. Chem. Soc. 2007, 129, in press ). Figure 6. Optical micrographs showing 1) a permeable molecular crystal constructed from hydrogen-bonded sheets joined by weak dipolar interactions and 2) a thin section cleaved from the crystal (Angew. Chem., Int. Ed. 2005, 44, 4021). The Wuest Group has found that atoms such as Si can be placed at the cores of tectons to act as loci of structural deformation, allowing single crystals to withstand changes of dimension of at least 30% without loss of crystallinity. Experiments and DFT calculations suggest that the special resilience of these crystals is due in part to the incorporation of highly flexible Si nodes in otherwise robust networks maintained by multiple hydrogen bonds (J. Am. Chem. Soc. 2007, 129, 3621; J. Am. Chem. Soc. 2003, 125, 14956). Other molecular crystals have been designed to possess combinations of valuable mechanical properties, such as an ability to be cleaved into potentially porous sheets (Angew. Chem., Int. Ed. 2005, 44, 4021). A crystal with these properties is shown in Figure 6. After developing deeper understanding of how molecular crystals can be created by design, the Wuest Group has begun to use this understanding to make less-ordered materials or even to thwart crystallization altogether. We have pursued this opportunity actively and have published a series of recent papers outlining new approaches for making liquid crystals, gels, and glasses (for example, see J. Am. Chem. Soc. 2007, 129, 13774 and J. Am. Chem. Soc. 2006, 128, 10372). 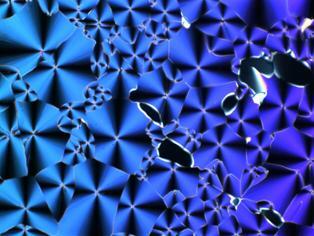 Images of columnar liquid crystals recently studied in the group appear in Figures 7-8. Figure 7. Polarized optical micrograph of a hydrogen-bonded columnar liquid crystalline phase (J. Mater. Chem. 2006, 16, 4695). Figure 8. 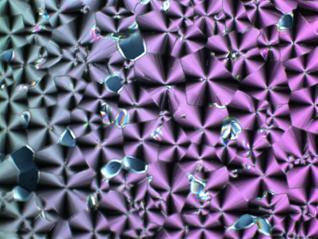 Polarized optical micrograph of a columnar liquid crystalline phase generated by a related compound (J. Mater. Chem. 2006, 16, 4695). Although molecules and relatively weak non-covalent interactions have a privileged place in our work, we have recently begun complementary studies of networks maintained by strong coordinative interactions with metals (Chem. Commun. 2007, 3166). 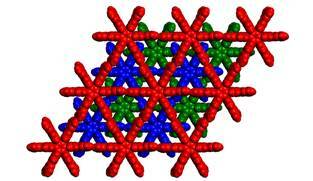 A representation of a new metal-organic framework made by the group is shown in Figure 9. Watch for more publications in this area in 2009! Figure 9. Representation of an interpenetrated SrAl2 metal-organic framework made by the coordination of a flexible tetrapyridine with Cu(I) (Inorg. Chem., submitted for publication). Figure 10. Results of a DFT calculation, showing the adsorption of trimesic acid on graphite (Langmuir, in press). Through collaborations, the Wuest Group is rapidly increasing its use of high-level computation to help explain observations and plan new experiments. Theoretical analyses are an integral part of many of our recent papers (for example, see J. Am. Chem. Soc. 2007, 129, 13774 and J. Am. Chem. Soc. 2007, 129, 3621). Figure 10 shows how this approach can yield a better understanding of molecular adsorption on surfaces. We are eager to expand this aspect of our work, and we welcome new members interested in computational projects. The Wuest Group has tended to place an emphasis on fundamental research, but we are increasingly interested in using our diverse skills to create useful new technology. 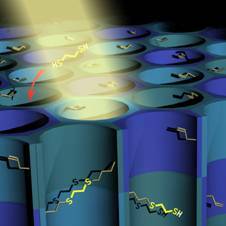 We have recently begun to participate in a start-up that targets improved thin-film solar cells, and we are acquiring the ability to carry out all the steps needed to design, construct, and test thin-film molecular devices. The projects outlined above help show how the Wuest Group works. Molecular design, synthesis, and structural characterization remain core strengths of the group, but we constantly cross traditional boundaries of disciplines within chemistry. The group has broadened the scope of its research far beyond the traditional frontiers of organic chemistry. We like to point out that we are one of a small number of groups versatile enough to published conceptually linked work in ACS journals as diverse as Cryst. Growth Des., J. Am. Chem. Soc., J. Org. Chem., J. Phys. Chem., Langmuir, Organometallics, Org. Lett., and Inorg. Chem., all within the space of a few years. Our interdisciplinary approach to research is also revealed by our ability to work confidently with a large part of the periodic table, and by our willingness to begin to master new fields whenever necessary. For example, our publications now show routine use of many new skills, including computation, electron microscopy, and scanning probe microscopy. Simultaneously, we are actively forging links with neighboring fields in which molecular association plays a key role, including macromolecular chemistry, inorganic chemistry, materials science, molecular electronics, surface science, and nanotechnology. We feel that our versatility has contributed directly to the success of our research projects and has enriched the training of members of the group. We enjoy working in a multidisciplinary environment that lets us undertake ambitious projects requiring a broad understanding of science. We hope this summary leads you to read our papers and perhaps even to think about collaborating with us or joining our group. As a member of the group, it is possible to focus on a particular aspect of our work, such as molecular synthesis. Many former members of the group have specialized in synthesis and now have jobs where this skill is highly valued, such as in the pharmaceutical industry. Alternatively, it is possible in the group to design projects that build a working knowledge of many different areas. Our new industrial collaboration that targets improved thin-film photovoltaic cells will create attractive opportunities for all the members of the group. Please contact us for more information!